Two main methods are available for the detection and differentiation of tumors by means of radioactive test substances: 1) scintigraphic imaging and 2) single probe detection. 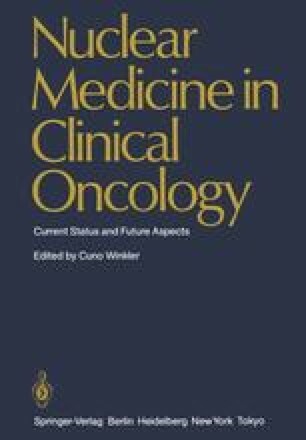 Since the introduction of digital data processing into nuclear medicine in the mid-60s [3, 11, 15] quite a few procedures have been developed for scintigraphy which have opened up important possibilities for tumor diagnosis, particularly in connection with gamma camera computer systems . Such systems have made it possible to assess data in a digital format for subsequent analysis and thus to obtain through image processing methods quantitative information on the uptake and turnover of gamma emitting tracers in suspicious areas.